As I’ve mentioned on my blog before, FamilySearch.org is one of my favorite genealogy websites. In fact, it’s a site I like so much that I just wrote a book about it, the Unofficial Guide to FamilySearch.org. So what is so great about this website? Here’s the top five reasons I love FamilySearch.org. 1. It’s free. Need I say more? 2. It’s got lots of records (and images). FamilySearch.org has millions of historical records. Some are transcriptions, while others have actual digitized images of original records. Records cover everything from U.S. censuses and vital records, to military records and local probate and court records. 3. It’s easy to use. The site is pretty easy to search, which makes it’s pretty easy to find records for your ancestors. Of course, there are many strategies to improve your searches to get better results (like using wildcards to find alternate spellings of names), but it’s easy to do an initial search for ancestors. 4. Family trees. The Family Tree section of the site lets you put your family tree online for free. As a bonus, FamilySearch.org recently added research hints to family tree entries, which helps you find records for your ancestors you may not have found already (or may not have thought to search for yet). 5. Source box. When you actually do find a record for your ancestors, FamilySearch.org makes it easy to keep track of the records you find via its Source Box tool. You can even organize your Source Box with folders (such as a folder for each surname you’re researching). There are many, many more reasons I enjoy using FamilySearch.org. 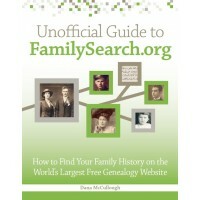 To find out more about how to use the FamilySearch.org website to find your ancestors, check out my new book Unofficial Guide to FamilySearch: How to Find Your Family History on the World’s Largest Free Genealogy Website, which is available now for pre-order on Amazon.com.